I rarely cover quartz watches, because they are seldomly regarded as ‘interested’ amongst us watch fanatics 🙂 However, besides quartz ladies watches and the Rolex OysterQuartz models, quartz watches with special features/functionality like the Breitling Aerospace or Omega Speedmaster X-33 can also be quite interesting. If you travel a lot, or have to do a lot of stopwatch/countdown timing, a digital watch like the Aerospace, X-33 or B1 might be the right pick for you. 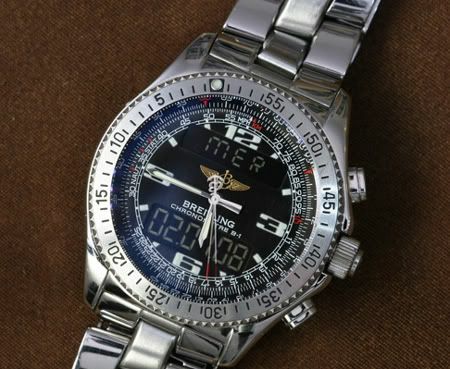 User TimetoLive over at TimeZone posted a few pictures of his B1 in the Breitling forum. Because these quartz watches are not as sought after as the mechnical watches of the mentioned brands, you can get these type of watches with lots of discount. In the case of the Omega Speedmaster Professional X-33, it might be interesting to do this ‘investment’ because it is one of the Omega watches with the lowest production number ever. Investment between brackets, because it probably takes at least another decade before it will gain some proper value again.